I took this photo in Berlin, but I can’t remember where now. Doesn’t it look like the statue on the right is getting ready to whack that poor woman in the head? This entry was posted in Travel Photos and tagged 50 Year Project, Berlin, City Life, Europe, Germany, Humor, Life, Photo, Photography, Travel, Travel Blog, Travel Journal, Travel Photo. Bookmark the permalink. Hee hee! Outside one of the museums on the island perhaps? Maybe, but I think I went to the museums on a different day. Doesn’t mean I wasn’t there twice. I tend to get turned around quite a bit when traveling (and in my own neighborhood). A tough neighborhood if that’s how they enforce their policies. I like the poster in the middle (FASHION) with some sort of Elizabethan? 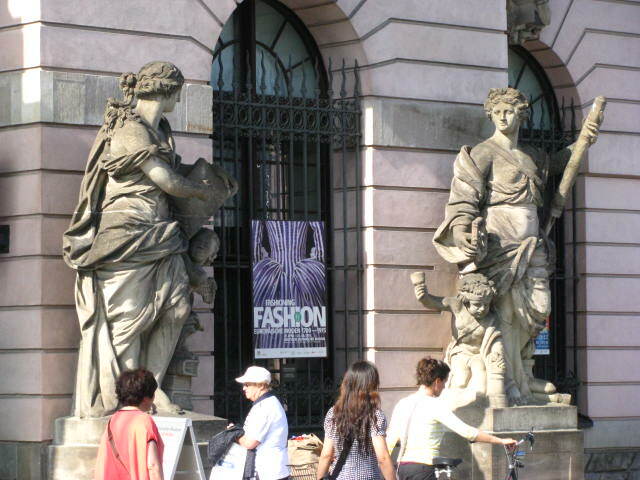 dress and the two ancient style statues on either side. It’s an interesting mix of styles in a small space. i loved the bear statue, in the little grove of trees. Ha! Good capture. You just can’t trust those statues. I really didn’t notice it until I looked at the picture when I got home. I doubt I noticed it when I snapped the photo. Just lucky to see it when I got back. Funny! Does look like it is up to no good! The female statue: Look I have proof here in this paper, you have 11 wives including me. How could you!! That pedestrian had better run very, very fast! I think she heard you and is safe and sound. Lucky for that passer by that these are real statues and not the people ‘made up’ to look like a statue – otherwise she could have been in real trouble. Yes, you have to be careful! Ha ha, good timing! I’ve been to Berlin, but I don’t recognize this place. I find it funny now, but not sure what I was actually taking a photo of.